NEW YORK — A painting Vincent van Gogh created while briefly working side by side with his friend Paul Gauguin in the south of France brought in $66.3 million at auction Tuesday. The painting, which had a presale estimate of more than $40 million, was sold to an Asian private collector, Sotheby's said. The auction record for a van Gogh, who died in 1890, is $82.5 million. Van Gogh expert Clifford Edwards, a professor at Virginia Commonwealth University, said, "To have a canvas from Arles by that very self-taught artist at the height of his work marks the sale as momentous." The sale also featured six paintings spanning four decades of Claude Monet's career. The highlight was "Water Lilies," a 1905 version of his beloved pond and gardens at his home in Giverny, France. It fetched $54 million, topping its high presale estimate of $45 million. Monet's 1908 painting of Venice with a view of the Palazzo Ducale on the Grand Canal fetched more than $23 million. It was confiscated by the Nazis from the noted collector Jakob Goldschmidt and was reclaimed by his son in 1960. It descended to a grandson, who died last year. The current auction record for a work by Monet is his 1919 "Water Lily Pond," which sold for $80.5 million in 2008. Sotheby's also offered works from two prominent single-owner collections. There were two works from Hollywood film moguls Samuel Goldwyn and his son. "Woman With a Chignon in an Armchair," a portrait of Pablo Picasso's lover Francoise Gilot, sold for $29.9 million, almost doubling its high presale estimate of $18 million. It depicts her in an embroidered jacket Picasso bought for her in Poland while she was pregnant with their child. Henri Matisse's "Anemones and Pomegranates" was purchased by the elder Goldwyn two years after it was painted in 1948. It sold for more than $6 million, in line with its presale estimate. About two dozen other works from the collection will be offered in a series of sales later in May, June and October. Samuel Goldwyn Jr. died in January; his father died in 1974. The other collection on Tuesday belonged to Jerome Stone, a Chicago businessman and founder of the Alzheimer's Association, who died in January. It included Fernand Leger's "The Blue Wheel, Definitive State," with a pre-sale estimate of up to $12 million. It fetched $10.5 million. Other artists in the collection included Joan Miro, Marc Chagall and Alberto Giacometti. A big price tag for a Van Gogh. 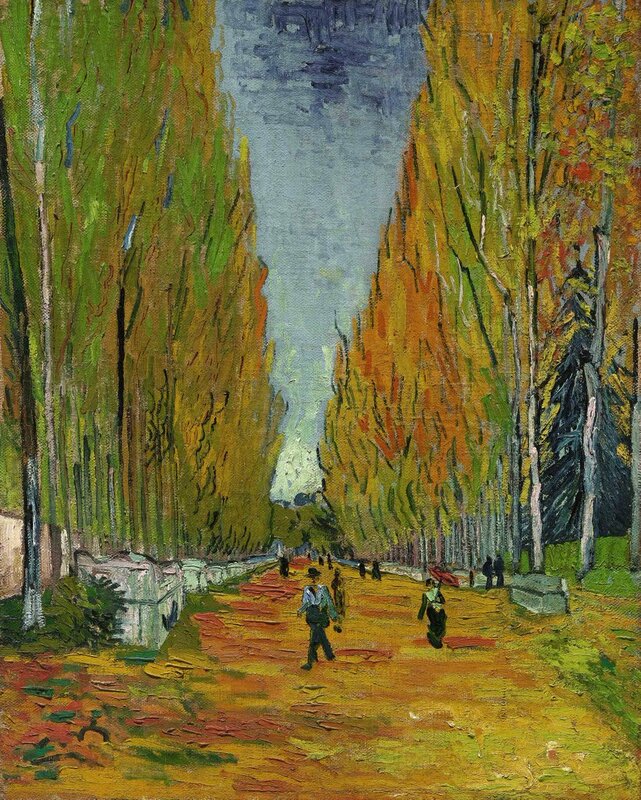 The painting called "The Allee of Alyscamps" (Say: Allay of Alliscomp) was created by Van Gogh while he briefly working side by side with his friend Paul Gauguin in the south of France in 1888. It brought in $66.3 million dollars at auction Tuesday. It was offered at Sotheby's impressionist and modern art sale. The autumnal scene was painted during a two-month period when van Gogh and Gauguin worked together in Arles, France. Sotheby's said the painting, had a presale estimate of more than $40 million, snf was sold to an Asian private collector, The auction record for a van Gogh is $82.5 million.